Online Conference Registration is now operational! With the exception of Saturday evening, all sessions will be held in the Wyneken Room at the International Center of The Lutheran Church—Missouri Synod (probably in the Wyneken Room), 1333 S. Kirkwood Road, Kirkwood, Missouri 63122. Each session will be followed by some questions and answers. This is our sixth annual conference. Our theme this year was, “Theistic Evolution – Contentious Compromise.” Our presenters showed that both God’s Word (Scripture) and God’s World (Science) affirm creation and reject evolution. 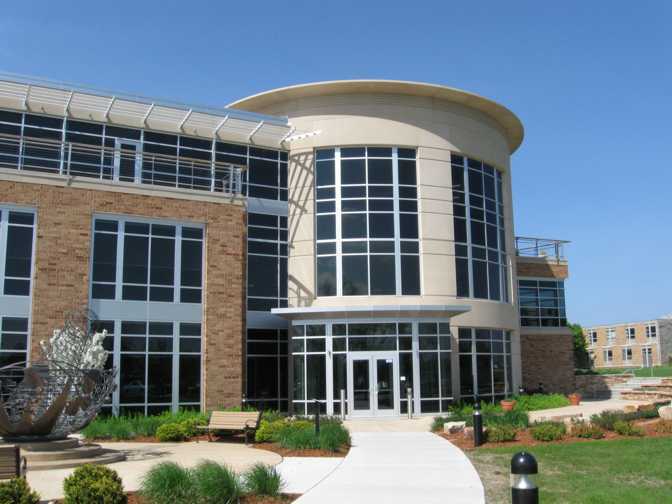 Our conference was held on the campus of Concordia University in Mequon, Wisconsin. We met Friday and Saturday, 29 and 30 June 2018. Presentations were in the Pharmacy building, PH 026. The full conference schedule and presentation abstracts in .pdf format follow. "Contentious Compromise - Why God Didn’t Use Evolution"
"Clearly Created - How God Formed Heaven and Earth"
Valerie Locklair, Dipl. C.A., F.C.A. Rev. Prof. Joel Heck, Th.D. Our fifth annual creation conference was held on the campus of Concordia University Wisconsin in Mequon, Wisconsin (20 minutes North of Milwaukee). The conference was held in our Pharmacy Building (PH on the map). New this year was a "basics day" held on Friday morning, 7 July. These presentations provided an introduction and overview of the Doctrine of Creation. Friday evening and Saturday focused on the conference theme of the age of the earth. Our presenters provided strong evidence that the earth and universe are thousands of years old, not billions as the evolution model supposes. Our keynote speakers were Dr. Don DeYoung and Dr. Russ Humphreys. Both are well known scientists who have thoroughly investigated the creation model and found it to be a true explanation for origins. Prof. Don DeYoung, PhD, is the chair of the Science and Mathematics department at Grace College where he serves as Professor of Physics. Dr. DeYoung is the President of the Creation Research Society, the oldest international professional society devoted to investigating the creation model of origins. Among his many books are Thousands Not Billions and 77 Fairly Safe Science Activities for Illustrating Bible Lessons. His website, discoveryofdesign.com, focuses on how God's designs in nature have inspired some of the greatest inventions and medical breakthroughs in history. Dr. D. Russell Humphreys is an international speaker on creation topics. Dr. Humphreys worked for Sandia National Laboratories in New Mexico for more than 20 years. His doctorate in physics served him well as he investigated nuclear physics, geophysics, pulsed-power research, and theoretical atomic and nuclear physics at Sandia. Among his many publications are Starlight and Time and Earth's Mysterious Magnetism. Dr. Humphreys serves on the board of directors of the Creation Research Society, the oldest international professional society devoted to investigating the creation model of origins. Society of Creation co-founders Dr. Joel Heck and Dr. Gary Locklair also presented. Special featured speaker was Mr. Jay Seegert with The Starting Point Project. ** Loyalty discount - if you have attended a past SoC conference, deduct $5 for a fee of $60 per person or $10 for a fee of $110 per family. The tentative schedule follows, with a printable registration form after that. Several origin theories for the moon will be surveyed, none of them convincing. In refreshing contrast, moon properties suggest intelligent design. Indicators of the moon’s recent creation include crater formation and lunar recession outward from the earth. Math is the underlying language of creation. Intricate patterns, symmetries and design exist throughout nature, all showing the fingerprint of the Creator. Examples include Fibonacci numbers, the fine structure constant, spiral structures and Mobius patterns. Mathematics can be applied to several creationist topics including earth’s age, life in space, uniqueness of snowflakes, biomimicry and the testimonies of math pioneers. We will look at parts of creation including the colors of light, fiber optics, water, air pressure, earth magnetism, plants, animals, stars and more. Part of this “science workshop” will be the identification of Midwest fossils. The session is designed for a family audience. God’s big magnets in the sky say the world is young. Almost every large body in the Solar System has, or once had, a strong magnetic field. A 1984 theory of mine suggested, on the basis of Scripture, how God created those fields, and I made five very specific predictions about what then-future space probes would find out about planetary magnetic fields. Every one of those predictions has now been verified, several in the last few years. They could have come true only if the Solar System is young, only thousands of years old. Magnetized Moon rocks say the Precambrian geologic era was between the Fall and the Flood. The Moon presently has no magnetic field. However, magnetized Moon rocks brought back by the astronauts say that it once had a quite significant field. The oldest rocks, having a radioisotope age (not true age) of nearly 4.5 billion years, show the Moon at that time had a field stronger than the Earth’s field is now, as large as my 1984 theory of field origins says it should have been. Younger rocks show a steady decrease of about a factor of ten every 0.5 billion years’ worth of radioisotope age. However, the only working theory for planetary magnetic fields says that for the seismically-measured size and composition of the Moon’s core, the Moon’s field should have decreased by a factor of ten every two centuries. That suggests that 0.5 billion years’ worth of nuclear decay was taking place every two centuries after creation. That would be about 4 billion years’ worth of nuclear decay occurring during the 1656 years the Bible says elapsed between the the Fall and the Flood. The other 0.5 billion years’ worth would occur during the year of the flood, according to the RATE project. In other words, the Moon’s magnetic clocks appear to say that the 4.0 billion-year-span of nuclear decay attributed to the Precambrian geologic era happened during the Antediluvian age. Among other things, that would mean that the impact craters on the Moon, most of them radioisotope dated at about 3.9 to 4.0 billion years ago, would have occurred during or before the third century after the Fall of Adam. Dr. Heck's presentation: "Creation in the Old Testament"
This topic will cover some of the many references to creation in the Old Testament, beginning briefly with Genesis 1. It will also cover much of Isaiah's comments on creation and address the meaning of the word "stretch," i.e., whether or not that word refers to God's stretching of the universe into its current size. Selections of passages will be taken from each of the three major portions of the Old Testament: the Law, the Prophets, and the Writings. The worldview presented to us by the media, public school systems and state universities is in stark contrast to the straight-forward reading of Scripture. We are intimidated by “science” and led to believe that no thinking person actually takes the Bible seriously. However, if we can’t trust the history in the Bible, how can we trust anything else, including its spiritual message? ​This talk gives an overview of the creation vs. evolution controversy and explains why it is so important to view the Bible as the final authority in all matters and that there is never any conflict between the Bible and science… just between the Bible and some scientist’s opinions. This topic is foundational to all other discussions regarding Christianity and will greatly aid in strengthening your faith in the Word of God (and help you not be intimidated by science)! Christians are often fairly united when it comes to the creation vs. evolution controversy. However, when it comes to the age of the Earth and “creation in six days”, there are differing views and often emotionally-charged debates, primarily because of how misunderstood this topic is. ​This presentation clearly demonstrates that even though the age of the Earth is certainly not the most important concept in the Bible, it is a significant issue and can also be discussed in a very gracious, God-honoring manner, allowing the Holy Spirit to be the ultimate arbiter of Truth, as opposed to being forced to rely on “experts” (including the presenter) to tell us what we’re supposed to believe. Adam and Eve: Myth or Reality? Our fourth annual creation conference was held on June 10-11, 2016 at the St. Paul, Minnesota campus of Concordia University. Sessions will be held in the Buenger Education Center (near the intersection of Syndicate Street North and Carroll Avenue). Unlike previous conferences, this one will be held on Friday night and Saturday to accommodate those who could not attend a conference during the week. People are making plans right now and sending in their registrations or registering online (see link below). The conference will be broadcast live from St. Paul to participants at Concordia University campuses in Mequon, Wisconsin; Ann Arbor, Michigan; and Austin, Texas. In Mequon, the live streaming will take place in Rincker 006, and in Austin it will occur in F-203 (the library). Keynote Speakers: Dr. Robert Carter and Dr. David Menton will eachbring two keynote presentations to the fourth annual creation conference on human origins. Dr. Carter holds a Ph.D. in Marine Biology and works as a senior scientist and speaker for Creation Ministries International (CMI). He lives in Atlanta, Georgia, with his wife Leanne. In retirement, Dr. Menton works with Answers in Genesis. He holds the Ph.D. in Cell Biology and has been associated with the Washington University School of Medicine in St. Louis, Missouri. The Bible clearly teaches that all people descend from a single couple that lived in the fairly recent past, but can this possibly be true? Does not evolutionary theory teach us otherwise, and why do so many evangelicals accept the evolutionary story of man's origin? It turns out that the data strongly point towards the biblical account of creation. There is abundant evidence for Adam and Eve, the biblical Flood, and the Tower of Babel in the human genome. To find it, all you have to do is look. The human genome can readily be compared to a computer operating system, but it is a more complex system than anything man has created to date. Part of the difficulty we are having with understanding how the genome works is that we are simply not as smart as God, the Master Programmer. When analyzing the genome, it has become clear that it operates on multiple levels simultaneously and recodes itself dynamically. Resisting every effort to explain the way it works in evolutionary terms, and how it came to be, the genome has surprised us with each new revelation about its inner workings. We often hear the expression that “beauty is more than skin deep.” While this is certainly true, beauty is also “skin deep.” In this presentation the marvelous functional complexity of human skin is examined in the light of an electron microscope. The body is covered with a thin layer of dead cells that keep us from drying out at a rate that would be fatal in a few hours. This layer, called the epidermis, has a precise organization that staggers the imagination. Pigment cells make little “umbrellas” that protect the genetic information in the epidermal cells. Sweat glands allow us to cool our body and work under high temperature conditions unmatched by any animal – except possibly the horse! The crowning glory of the skin is the hair. The complexity of a single hair as seen in the scanning electron microscope should alone be a sure cure for atheism. The conference schedule appears in the file below. We are using a Friday evening and Saturday morning and afternoon schedule in order to allow people who work a five-day week to attend without having to take off work. We are not working with concurrent sessions (workshops) this year, but the rest of the program will look very similar to previous conferences. Our third annual creation conference was held 6 - 8 July 2015 at the Ann Arbor, Michigan campus of Concordia University. The conference took place in the Concordia gymnasium, and it was simulcast back to the campus of Concordia University Wisconsin, Mequon, Wisconsin, where the first two conferences were held. Dr. Tom Saleska handled local arrangements in Mequon.Our first keynote speaker for the conference is Dr. Kevin Anderson, who spoke at the 2014 conference. His bio appears below. In addition, Dr. Tim Clarey, from the Institute for Creation Research, will be our second keynote speaker. He holds a Ph.D. in Geology from Western Michigan University, has experience as an exploration geologist for Chevron USA, Inc., and is a contributor to Guide to Dinosaurs. The conference schedule and cost will be similar to the 2014 schedule with plenary sessions and concurrent sessions (or workshops). Meals will be on your own, since there are numerous restaurants in the area. We will especially be hearing about dinosaur remains that have been discovered (especially soft tissue, i.e. collagen) and what such evidence indicates about the age of the Earth and the date when such dinosaurs died. Dr. Heck will present a plenary session that discusses the impact of Darwinism on our world today and even upon some people's understanding of Genesis 1. Dr. Locklair will talk about positive evidences for the creation of diverse forms of life. This presentation examines four myths of dinosaurs that are commonly taught to the public. Fossils are often claimed to take millions of years to form under slow burial conditions. Geologic data suggest otherwise. Fossil preservation requires a rapid burial under catastrophic conditions. Dinosaurs also are claimed to have evolved from a common ancestor, yet no ancestors are found in the rock record for the different dinosaur groups. The relationship of dinosaurs and birds is also examined and refuted. A review of the recent soft tissue discoveries leads to the conclusion that dinosaurs were created just thousands of years ago. Dinosaurs were created, just like the Bible says for all animals, they were on the ark, and ultimately they went extinct post-Flood. "Unlocking the Mysteries of the Genesis Flood"
This presentation reviews and updates rock and fossil evidence supporting a global Flood. It examines the fossil record of the dinosaurs within the context of the entire geologic column. It presents original research on the six megasequences deposited across North America and the world. Data for this research project was derived from more than 560 rock outcrops and oil well cores and logs across the continent.Scientific explanations, from a Biblical perspective, are given for the extensive sedimentary deposits and the fossil record. The presentation offers a data-driven model that explains the rapid burial of dinosaurs during the Flood, and provides implications for pre-Flood geography. It further presents a working model to explain dinosaur occurrence within the Mesozoic Erathem. All data support a global and recent Flood as described in Genesis. "Dead Bones - Not so Dead After-all"
Dinosaur fossils are often used as the ‘proof fossils’ of evolution. According to standard geological dating, dinosaurs first appeared some 250 million years ago. Members of this clade (Dinosauria) then supposedly evolved, spread, and diversified over the next 200 million years, before disappearing from the record about 65 million years ago. Paleontologists generally interpret the dinosaur fossil record (appear, diversify, disappear) as a clear demonstration of neo-Darwinism. However, the presence of pliable, soft-tissue within dinosaur fossils challenges this interpretation. This tissue has been found in a variety of dinosaur specimens, including a Tyrannosaurus femur and a Triceratops horn. Within this tissue is intact bone cells (e.g., osteocytes) and proteins (e.g., collagen and actin). However, all known protein decay rates and tissue degradation patterns show these are fragile biological materials, which are readily degraded by numerous environmental conditions. Evolutionists have proposed several explanations for the preservation of this biomaterial, but all lack adequate mechanisms to explain such prolonged and detailed preservation. Rather, the soft-tissue data directly challenges the entire ‘millions of years’ paradigm, which is required for neo-Darwinism. Thus, it also strongly challenges the paleontologist interpretation that the fossil record shows evolution. However, the data is fully consistent with a young earth creation model. "The True Origin of the Species"
While Darwin titled his book Origin of Species, he did not specifically address the origin of new species. Instead, he described biodiversity and discussed a wide variety of adaptive changes and speculated on their significance. In fact, secular scientists typical insist that evolution is just simply any biological change. However, mere change fails to provide a mechanism for the universal common descent of all life (a standard prediction in neo-Darwinism). It also does not explain the origin of different species, nor contradict predictions of a creation model. In fact, a creation model does not predict ‘fixity of species,’ rather ‘fixity of created kinds.’ As a man-made classification scheme, species is often ill-defined and difficult to identify. This imprecise classification has allowed evolutionists to assume any type of change could produce new species, which, in turn, supposedly provides the needed mechanism for “common descent” of all species. There is still much that remains unknown about how a new species may arise, but current genetic data suggests that true speciation is frequently a degradative process – the opposite of evolutionary requirements, but easily understood within a creation model. Kevin Anderson, "iDINO – What’s next?" The second phase of the Creation Research Society’s research initiative (iDINO II) will look more extensively at the process of fossilization. The first phase of the project added to the growing evidence demonstrating the preservation of pliable tissue, intact cells, and proteins within dinosaur fossils that are claimed to be over 65 million years of age. In light of this data, evolutionists are seeking methods that could account for the preservation of this fragile biomaterial for millions of years. iDINO II will investigate these preservation claims as well as seek a better understanding of the fossilization process; providing insight of which mechanisms of preservation are most plausible. Microbial biofilm activity appears to be an integral component of fossilization, although the process is only partially understood. In addition, creationists have suggested that fossilization can occur quickly under specific conditions; such as rapid burial and high pressure, which could have occurred during the Genesis Flood. These results continue to challenge the standard assumptions used when dating the geological column. One characteristic of life is that it can respond to the environment. Our bodies were made to respond to temperature, humidity, altitude, and a host of other factors in the environment. An example of adaptation will be explored that highlights immediate, intermediate, and long term changes that occur when adapting to a new environment. This ability is complex, and an essential characteristic for life. Evolutionists have long claimed that genetic adaptation is the result of natural selection working on chance errors that appear in DNA. Such adaptation is part of the diversity we see within created kinds today. It will be shown that the evolutionary explanation is unrealistic; a far more reasonable way is to understand genetic adaptation as an extension of the physiologic and developmental adaptation we already observe. The Bible’s historical framework and current knowledge in biology suggest that genetic adaptation is only possible because of the foresight and wisdom of the Designer who provides for the needs of his creatures. Dr. Lightner studied animal science and veterinary medicine at The Ohio State University. She received a B.S. in Agriculture (1978), a doctorate in veterinary medicine (D.V.M. ; 1985), and a M.S. in veterinary preventive medicine (1987). Today she is active in research and writing in the areas of biology and genetics. She has found that the biblical history provides a more robust framework for understanding the biological world than the evolutionary one she was taught in school. Based on the biblical history and what is known from genetics, there are some clear predictions that can be made which are increasingly being confirmed by the scientific literature. In addition to her research, Dr. Lightner is an adjunct instructor with Liberty University Online, teaching biology and creation studies. She also serves as a board member of the Creation Research Society (CRS), an organization that averages over 650 voting members who have advanced science degrees and hold to a ‘young earth’ view of creation. Children today are experiencing and learning about creation in ways which are very different from previous generations due to a reduction in the amount and type of time spent outdoors. As a result, it is becoming increasingly difficult for people to hear God’s voice in nature and to understand how the scientific study of nature can point us directly to the Creator. As time spent outside decreases the struggle to hear God’s voice in nature is compounded when the message of creation is confused and undermined by teachings that remove God from the wonders of nature and replace him with chance and necessity. To enable families to hear the message God speaks to us through His created world, we must not only provide information about where to go to find these wonders of creation, but also provide resources that give credit and glory to God and the Creator and Sustainer of our world. Stacy is a home-educating mother of five, living in the beautiful Northwoods of Wisconsin. Stacy graduated from Michigan Tech University in 1997, with a B.S. in Geology, and earned a M.S. in Environmental Education from Concordia University Wisconsin in 2015. Stacy is passionate about getting people outside to experience God in the wonder of His creation. In addition to her own children, she shares this love with on-line students in the science classes she teaches through Landry Academy and through programs she has developed at Christ Serve Ranch, an environmental learning center in Henning, MN. Stacy has also worked to create a field guide to sites of geologic interest in Wisconsin and the Upper Peninsula of Michigan from a biblical worldview. Stacy married her hero in 1998 and has been incredibly blessed by his support and encouragement. In her free time she enjoys acting as a chauffeur for her children, spending time outdoors in any weather, and is an avid reader. When it comes to the debate on the differing views of creation amongst Christians, the fields that are consulted are biblical studies/theology, philosophy, and science. Many young earth creationists already argue on both biblical and philosophical grounds that prelapsarian animal death poses a major problem for old earth creationism. Fewer arguments have been made from aesthetics and animal disease and suffering. God is a beautiful creator who has created beautifully, and this serves as a powerful reason why one should adopt the young earth position. Miguel Benitez Jr. is a middle and high school teacher at Life Christian Academy in Kissimmee, FL as well as Adjunct Instructor of Worldview at Belhaven University's Orlando campus. He received his B.A, in Interdisciplinary Social Sciences with a minor in Anthropology, his M.A. in Christian Apologetics, and is currently pursuing his PhD in Humanities with a concentration in Philosophy with Faulkner University. Miguel is also the Central Florida Director of Operations for Doubtless Faith Ministries, which is an Apologetics ministry based out of Jacksonville, FL that puts on conferences at churches to help them equip the saints in the defense of the faith. Miguel and his wife Daniela had their first child, Miguel Alexander, in April of this year. While gradualism is a fundamental assumption of "orthodox" Darwinism, there is a striking scarcity of rigorous studies if it can achieve complexity. The assumption is that complexity and big-step evolutionary changes happened gradually over small steps. In contrast, competing Darwinian views propose various forms of saltation evolution where big changes happened quickly and abruptly. Both sides are analyzed and shown to fail in explaining complexity and macroevolution (and therefore each side is correct in criticizing the other). Objections to intelligent design arguments are discussed as well. A distinction is made between parts and functions. Consequently macroevolution (the part where the Darwinian evolution fails) is defined as as the evolution of coordinating functions (as opposed to the evolution of parts or properties which is microevolution). While common ground (and subsequently fruitful discussion) with Darwinists is often hard to find, such a common ground is identified in agreeing with Darwinists' claim that if complexity is reducible to small steps then such complexity is within the reach of evolution. However, the conclusion is that, except for very simple cases, coordinating functions cannot be reached gradually, by small steps, even if natural selection was intelligent instead of blind. I became an atheist early in school due to the communist teaching I had under the communist regime in Romania. Then in high school I became a Christian by reading Christian literature smuggled into Romania and then the Bible. By the time I finished high school the Revolution took place in Romania and a new Bible college was started. At that point I gave up my plans to pursue science and went to the Bible college where I got a bachelor's degree so that I can help people spiritually. I worked as an intern and interim pastor both in Romania and US, I also taught at a Christian school and high school and for the last 15 years I've been working in IT. For the last 7 years I've worked at Chicago Board Options Exchange where I'm a software architect. I live in Chicago with my wife and and two kids - a 4 year old daughter and a 2 year old son. My love for science continued throughout college and afterwards, being particularly interested in theoretical physics, evolution as well as some branches of mathematics. I am currently writing a book on evolution which my current presentation at the conference draws upon. How to teach and preach the authority of biblical creation, including dinosaurs, with nothing more than the book of Genesis and the five senses God gave us. In this session, we will gain a confidence and respect for the authority of God’s Word and the gift of science, as we engage in this important conversation within the secular world. We will explore the evidence of the fossil record, the Flood, a literal reading of Genesis, and the faith that God has given us everything we need to know Him and trust His Word. Pastor Eric Gledhill. Undergraduate and graduate biology training. Served as a biology teacher at Lutheran High School West in Rocky River, OH. Invited to speak and defend creation at various conferences focusing on the creation/evolution debate. Speaker and presenter for creation panel at the Concordia Seminary, St. Louis, MO. Passionate supporter and proclaimer of the gospel of Jesus Christ, and lover of God’s people. David Bump is a graduate of Bob Jones University and a sustaining member of the Creation Research Society. He has contributed articles to the CRS newsletter Creation Matters. "I debated Dr. Richard Milo, anthropologist, at Chicago State University in 2000. Download, print, cut and paste, or otherwise use the following bulletin announcements in your church publications. The Improbability of Chance, Mutation, and Natural Selection"
Our second creation conference took place June 30 to July 2, 2014 at the Mequon, WI campus of Concordia University. The conference focused on the origin of life, and secondarily the amazing complexity of DNA and the individual cell. Our keynote speakers were Jay Seegert, from the Creation Education Center, Waukesha, Wisconsin and Dr. Kevin Anderson, from the Creation Research Society in Arizona. Both Dr. Gary Locklair and Dr. Joel Heck also presented, as indicated below. We had a selection of workshops, or concurrent sessions, also. Even though certain aspects of evolution occasionally seem fairly plausible, when you "peek under the hood" to see what actually has to go on inside (in the DNA) we see a very different picture. Presenting some cutting-edge information about DNA, this presentation clearly demonstrates that molecules-to-man evolution is virtually impossible. Using the human ear as the main example, this topic briefly addresses the origin of "information" and the origin of species, showing that mutations and natural selection are completely incapable of producing molecules-to-man evolution. Gary Locklair "Positive Creation Evidences"
God created life as matter with teleonomy (information content). All life on planet earth was originally fashioned by God. Since this is true, there should be a number of scientific evidences that can be used as support. What are these evidences and what is an effective way to present and discuss the evidence? From the Law of Biogenesis to probability; from complexity to information theory, there are many evidences to support the origin of life by God's creative activity. Any evidence can be expressed either as a negative argument against evolution or as a positive argument in favor of creation. This presentation will focus on defining and presenting positive arguments in favor of the creation of life. On July 8-10, 2013, Concordia University Wisconsin hosted a creation conference with the theme, “The Heavens Declare: What Astronomy Can Tell us about Biblical Creation.” The conference began on Monday, July 8, at 1:00 p.m. and ended at noon on Wednesday, July 10. Keynote speakers were Dr. Danny Faulkner and Dr. Don DeYoung, both members of the Creation Research Society (CRS). DeYoung spoke on “Our Nearest Neighbor, the Moon” and “The Discovery of Design.” Faulkner, now on staff with Answers in Genesis, spoke on “Biblical Astronomy” and “Astronomy’s Young Age Indicators.” The full conference schedule appears below. The conference was convened and cosponsored with Concordia University Wisconsin by the co-founders of the Society of Creation, a 54-member creation organization within the Concordia University System, which is a system of ten universities operated by The Lutheran Church—Missouri Synod. While the Concordia University System is a Lutheran system of institutions, the conference is open to members of all denominations. Both co-founders, Dr. Gary Locklair, computer science faculty at Concordia University Wisconsin, and Dr. Joel Heck, theology faculty at Concordia University Texas, are also members of CRS. Concordia University Wisconsin Pharmacy building, where the conference took place. Some of the 159 people in attendance, July 8-10, 2013. 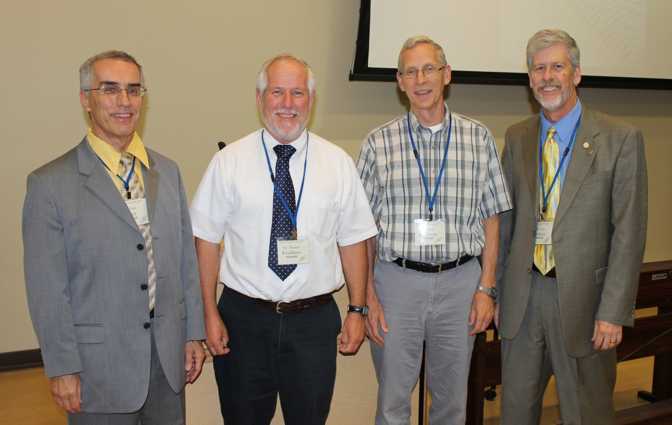 The four plenary speakers (from left to right): Dr. Heck, Dr. Faulkner, Dr. DeYoung, and Dr. Locklair. Don DeYoung chairs the Science and Mathematics Department, Grace College, Winona Lake, Indiana. He is a graduate of Michigan Tech University, Iowa State University (Ph.D., Physics), and Grace Theological Seminary. He has written many articles and books on Bible-science topics. Dr. DeYoung is currently president of the Creation Research Society with 1700 members worldwide. Don speaks on a broad range of creation topics and believes that the details of nature are a powerful testimony to the Creator’s care for mankind. The Bible mentions many topics dealing with astronomy. This talk will survey what the Bible says about the heavens, the sun, moon, and stars, as well as other things dealing with astronomy. This will allow us to put in context a biblical approach to astronomy. The creation model is that God made everything in six normal days just a few thousand years ago. While secular scientists have interpreted much of the world in terms of billions of years, we might expect that there is evidence from astronomy that the creation is much younger than that. This presentation will cover some of this evidence. "Our Nearest Neighbor, the Moon"
The moon's origin, age, and design are considered. Natural origin theories for the moon continue to rise and fall. None are convincing and supernatural creation remains a credible alternative. Age indicators which challenge evolutionary deep time include crater formation and lunar recession. Multiple purposes for the moon's creation are suggested, each showing intelligent design. Biomimicry is a popular topic in current science and technology. Inventors and researchers look to nature for ideas on new products and solutions to technical problems. Instead of indicating the result of evolutionary fine-tuning, these ideas show intelligent planning for our benefit. Several design examples which benefit space technology will be given. We are all interested in our origins and most people want to learn more. What are some effective techniques to teach and learn about origins? Prof. Locklair has taught a popular and successful course on the science of origins, Cosmogony, at Concordia University for a number of years. Cosmogony attempts to answer a grand question: how did the universe originate? He will share insights into “teaching the controversy” and discuss a number of scientific evidences from the realm of astronomy. The role of logic and the proper use of evidence and its interpretation in origins will be investigated. "The New Testament on Creation"
Since all of Scripture comes from the same God, we should expect a consistent picture of creation from both the Old Testament and the New Testament. This talk explores the dozens of New Testament references to creation in four broad categories: (1) Echoes or allusions, (2) References to the beginning of time, (3) References to events during the creation week, and (4) Significant events during creation that are dated in a general way. In conclusion, the speaker draws some conclusions about the perspective provided by the various New Testament writers and characters, including Jesus.